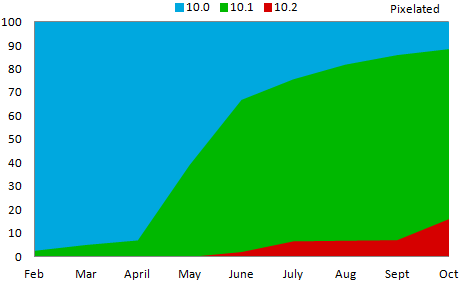 Despite the rapid adoption seen earlier this year of OS 10.1 the adoption of OS 10.2 has gotten off to a bit of a slower start. Statistics are shown from the entire month of October, so it does include a few days before the upgrade was officially released, but a decent percentage of users had already downloaded leaked versions of the OS the month before. 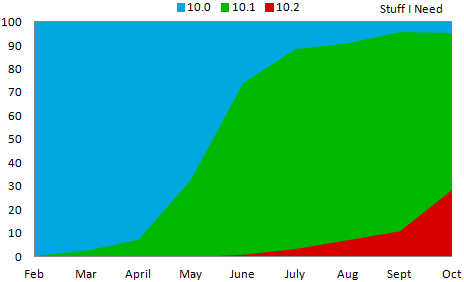 Downloads of Pixelated showed 16.2% of users running OS 10.2 in October, while downloads of Stuff I Need showed 28.2% of users on 10.2 during the same month. This data was collected by BlackBerry World for downloads of the free strategy game Pixelated and the free checklist app Stuff I Need. Data shown on the chart is from the beginning of February 2013 through the end of October 2013.